Knet.jl is a deep learning package implemented in Julia, so you should be able to run it on any machine that can run Julia. It has been extensively tested on Linux machines with NVIDIA GPUs and CUDA libraries, but most of it works on vanilla Linux and OSX machines as well (currently cpu-only support for some operations is incomplete). If you would like to try it on your own computer, please follow the instructions on Installation. 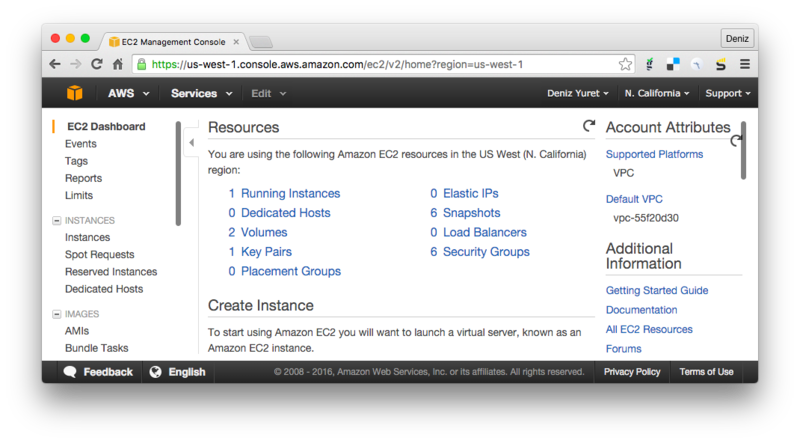 If you would like to try working with a GPU and do not have access to one, take a look at Using Amazon AWS. If you find a bug, please open a GitHub issue. If you would like to contribute to Knet, see Tips for developers. If you need help, or would like to request a feature, please consider joining the knet-users mailing list. Some Knet examples use additional packages such as ArgParse, GZip and JLD. These are not required by Knet, you can install them manually when needed using Pkg.add(“PkgName”). Run Pkg.build("Knet") to recompile Knet after optional packages are installed and to compile the Knet GPU kernels at first installation if you have a GPU machine. To make sure everything has installed correctly, type Pkg.test("Knet") which should take a minute kicking the tires. If all is OK, continue with the next section, if not you can get help at the knet-users mailing list. Please get an account at github.com. Point Julia to your fork using Pkg.clone("git@github.com:your-username/Knet.jl.git") and Pkg.build("Knet"). You may want to remove any old versions with Pkg.rm("Knet") first. Make sure your fork is up-to-date. Retrieve the latest version of the master branch using Pkg.checkout("Knet"). Test your code using Pkg.test("Knet"). Please submit your contribution using a pull request. 2. Make sure you select the “N. California” region in the upper right corner, then click on AMIs on the lower left menu. At the search box, choose “Public images” and search for “Knet”. Click on the latest Knet image (Knet-0.8.0 as of this writing). You should see the following screen with information about the Knet AMI. Click on the “Launch” button on the upper left. 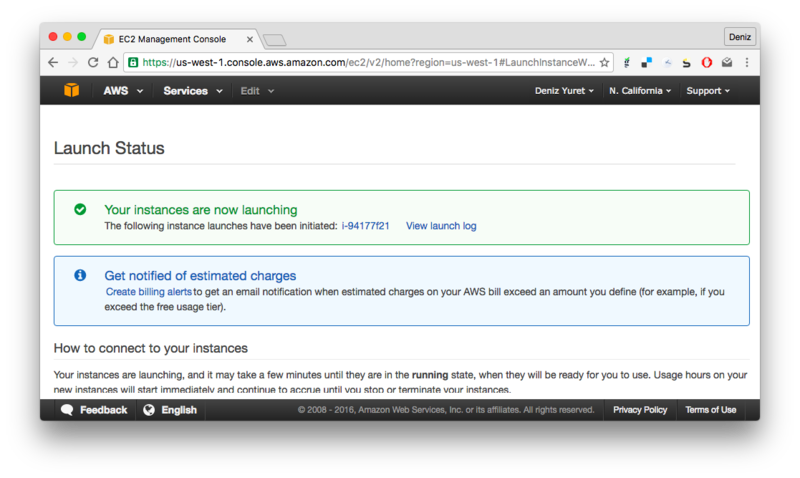 Note: Instead of “Launch”, you may want to experiment with “Spot Request” under “Actions” to get a lower price. You may also qualify for an educational grant if you are a student or researcher. 3. You should see the “Step 2: Choose an Instance Type” page. Next to “Filter by:” change “All instance types” to “GPU instances”. This should reduce the number of instance types displayed to a few. 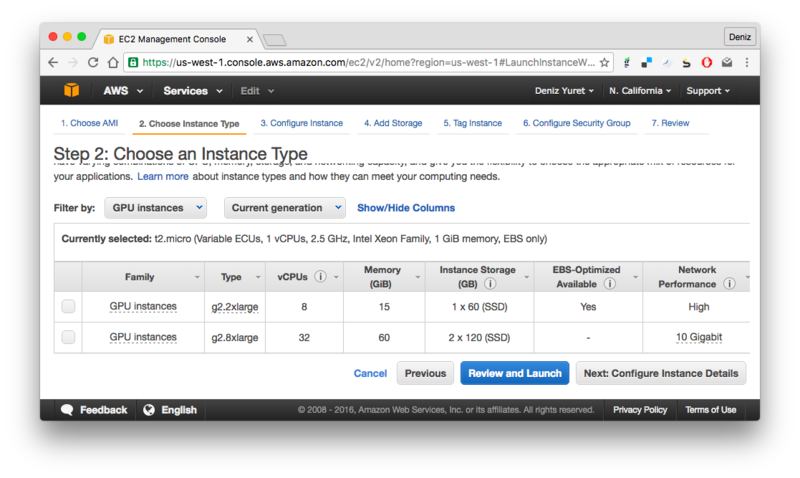 Pick the “g2.2xlarge” instance (“g2.8xlarge” has multiple GPUs and is more expensive) and click on “Review and Launch”. 5. You should see the “key pair” pop up menu. 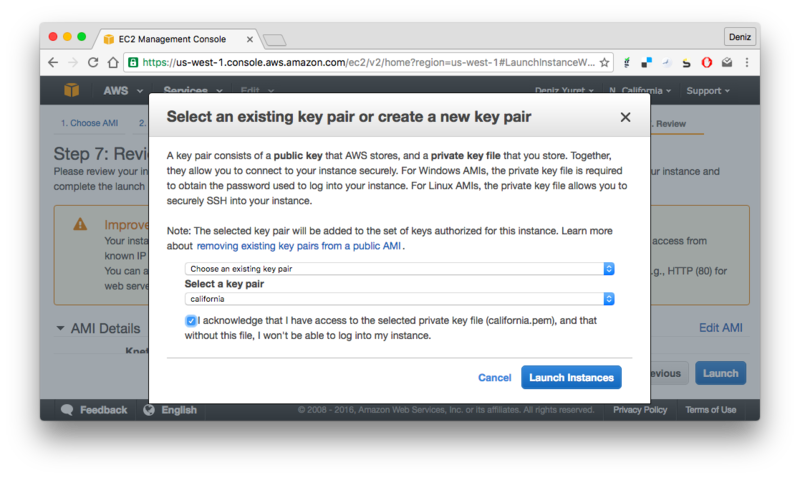 In order to login to your instance, you need an ssh key pair. If you have created a pair during the initial setup you can use it with “Choose an existing key pair”. Otherwise pick “Create a new key pair” from the pull down menu, enter a name for it, and click “Download Key Pair”. Make sure you keep the downloaded file, we will use it to login. 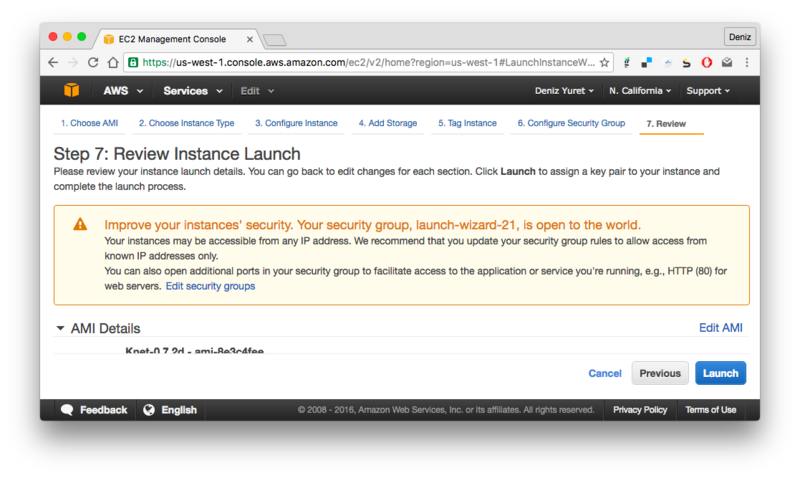 After making sure you have the key file (it has a .pem extension), click “Launch Instances” on the lower right. 7. You should be taken to the “Instances” screen and see the address of your instance where it says something like “Public DNS: ec2-54-153-5-184.us-west-1.compute.amazonaws.com”. 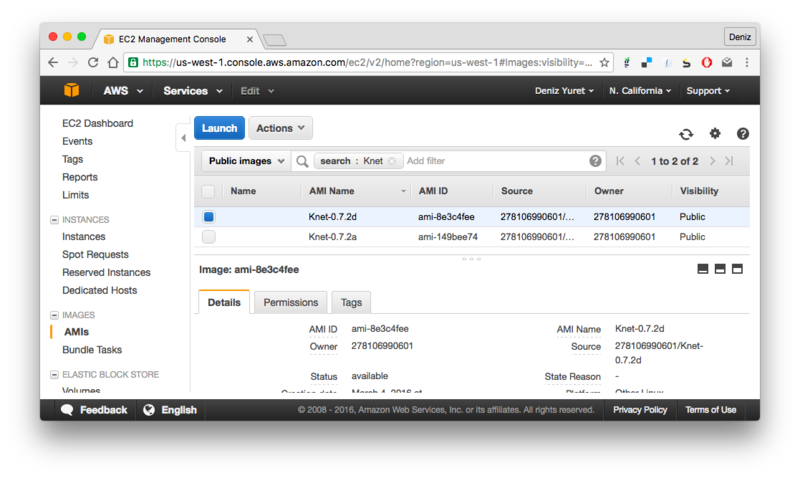 Replacing knetkey.pem with the path to your key file and ec2-54-153-5-184 with the address of your machine. If all goes well you should get a shell prompt on your machine instance.